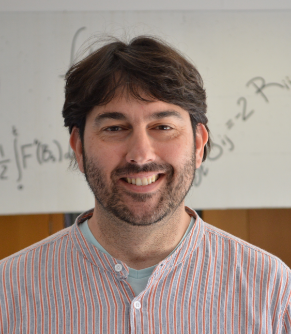 I am a senior research fellow at the Centre de Recerca Matemàtica (CRM) and member of the Computational and Mathematical Biology group lead by ICREA Prof. Tomás Alarcón. I am also an associate professor in the department of Experimental and Health Sciences at the Universitat Pompeu Fabra (UPF, Barcelona). Prior to joining the CRM in January 2017, I was a postdoctoral researcher at the Complex Systems Lab at the UPF. I completed my Ph.D. in Biology in 2009 at the Universitat Pompeu Fabra, with a dissertation based on nonlinear replicator dynamics applied to the origins-of-life problem, to the evolutionary dynamics of RNA viruses, and to theoretical and computational ecology. After my PhD thesis I did a postdoc at the Evolutionary Systems Virology Group lead by Prof. Santiago F. Elena (CSIC-UPV in València) and at the David J. Gladstone Institutes (University of California San Francisco, USA). Knowledge Transference Prize 2010 in health and life sciences to the PhD thesis: Dynamics, Evolution and Information in Nonlinear Dynamical Systems of Replicators, awarded by the Social Council of Universitat Pompeu Fabra (UPF), Barcelona (Spain). PhD extraordinary prize 2009 awarded by the UPF Doctorate and Postgraduate Commission. My research spans de fields of dynamical systems and applied mathematics in Biology. I am particularly interested in bifurcation theory and its applications in systems biology and biomedicine. Together with the topics developed during my PhD and my three postdocs, I am currently doing research on cancer dynamical systems, focusing on the impact of tumor genetic and non-genetic heterogeneity in the fate of cancer cells. Also, I am doing research on stochastic dynamical systems and synthetic biology.